11 synthesizers (including Roland XV 5080, XV-2020, Emulator E4K sampling keyboard & Korg Triton Rack), 4 drum machines, 3 x sample players, 64-channel Mackie & 48-Channel Yamaha O2R Automated Mixing Consoles running in tandem, 7 FX processors, CD Mastering, Emagic ver.5.5 64-track recording software with MOTU Digital Audio recording system, JBL & Wharfdale Pro Monitoring speakers, 1 x Yamaha Acoustic Guitar, 1 x Ibanez Artist Electric Guitar, 1 x 1963 Fender Precision Bass Guitar, 1 x Buescher and 1 x Roy Benson Alto Saxophones, 1 Mbira & 1 Kalimba, plus various flutes. 1 x Audio Technica & 1 x Brauner Studio microphones. Note: When dialing from outside of South Africa, dial your external country code, then 2711-435-9940. Example, when dialing us from Germany, you would dial 00 2711 435 9940. 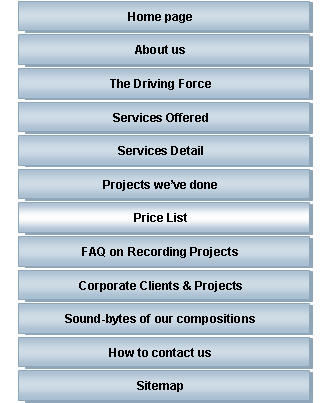 · Vocal/Performance Room: 9 sq m.
Producer & Engineer (Claude King) included in all rates, no extra cost. Beyond 6 p.m.: Normal rates plus 20% surcharge. (1) Special rates apply under the following conditions: the project is started and ended within one period, i.e., no breaks in-between. For example, if the project is started and goes for 4 days (perhaps amounting to a total time of 50 hours) and is then broken off, and continued a few days/weeks/months later for another 50 hours, the full rate of R250 per hour will be charged. (2) A 50% deposit is required of the estimated total project cost, before work commences, and final payment must be made halfway through the project.